Celebrate with Olaf and 3 Snowgies from Anna's birthday party in the Walt Disney Animation Studios' short, Frozen Fever. Mix and match all the pieces, including the Snowgies! With a birthday cake, 2 cups, and a snow globe gift for Anna, Olaf is ready for a fun celebration! 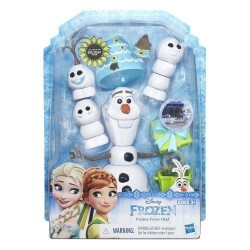 •Includes Olaf (12 pieces), 3 Snowgies (3 pieces each), gift box with a removable top, snow globe, 2 glasses, cake slice, and cake.